Every once in a while you come across a person who seems to exude a bright spirit. There is a sparkle in the eyes and a pleasant tone in the voice that is somehow encouraging that it’s a good day. After a few moments with this person, things seem brighter and better. Balanced. 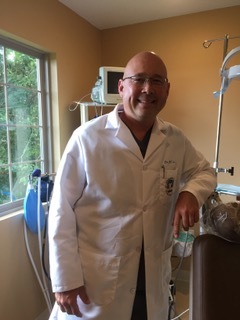 For Oral and Maxillofacial surgeon Dr. Jeff Lee, who practices in Marietta and Cambridge, the balance is kept in check every morning when he opens his eyes. Dr. Lee’s gratitude for life comes from being raised in the Catholic church, with parents who were also interested in the area of personal growth. There were many books from authors such as Tony Robbins, Zig Ziglar, Dr. Wayne Dyer, and others about being your best and how to achieve. His household set goals and set out to do them. Six to nine months of studying newer literature about the mind, built on his previous studies in medical training brought some strong insight. “Breaking it down is really simple. You have two minds: a primitive mind, the caveman brain, fueled by any kind of food, to get everything right now. It just wants to survive. It’ll always pick survival, never worry about tomorrow. “I had a real problem with my caveman brain wanting everything now. My fourteen years of medical study strengthened my other, the frontal brain, then it gradually overcame the primitive side. Lee says we didn’t understand this continual development until the functional MRI became a scientific thing. We can now see how the mind literally changes with meditation, yoga, prayer, exercising, doing different things. There is proof that certain parts of the frontal brain become more developed and exerts command over the primitive brain. As for the exercise part of renewal, Dr. Lee doesn’t use the gym. He owns a farm, and there is plenty of hard work to be done there. Dr. Lee says we can literally change the makeup of your mind. We can practice making new habits and breaking old ones. We can be the best expression of ourselves. Dr. Lee’s guiding principles are biblical: rejoice always, in all things be grateful, and pray without ceasing.